Though he works in perhaps the most hyped field of science there is, Dr. Richard Sutton comes across as remarkably grounded. 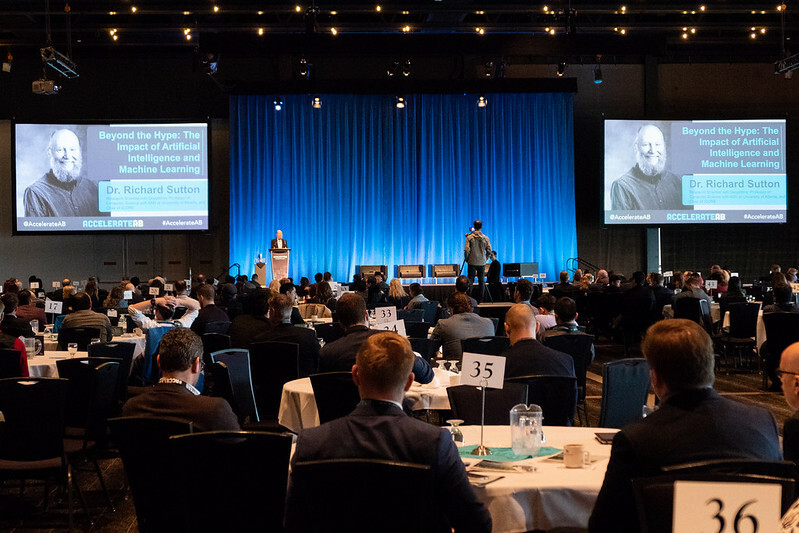 I heard him described at the 2018 AccelerateAB conference on Tuesday as “the Wayne Gretzky of artificial intelligence” and he’s often called a global pioneer in the field of AI. Sutton has spent 40 years researching AI and literally wrote the textbook on Reinforcement Learning. But he spent the first part of his closing keynote discussing the tension between ambition and humility. “It’s good to be ambitious,” he told the audience tentatively. “I’m keen on the idea of Alberta being a pioneer in AI.” But he tempered that by discussing the risk of ambition turning to arrogance and affecting the work of a scientist. Sutton made sure to highlight the word “science” and noted that we fall behind when it comes to the application of AI. And of course, he backed up his claim with sources, citing DeepMind’s decision to open an international AI research office here at the University of Alberta, and pointing to the csrankings.org site which ranks the U of A at #2 in the world for artificial intelligence and machine learning. So how did Edmonton come to be such a leader? It started with Jonathan Schaeffer’s work in the 1990s on Chinook, the first computer program to win the world champion title in checkers. The U of A’s growing expertise in game AI helped to attract a number of AI/ML professors and funding from the provincial and federal governments throughout the early 2000s. Edmonton’s rise to AI prominence was cemented with DeepMind’s recent decision to locate here. 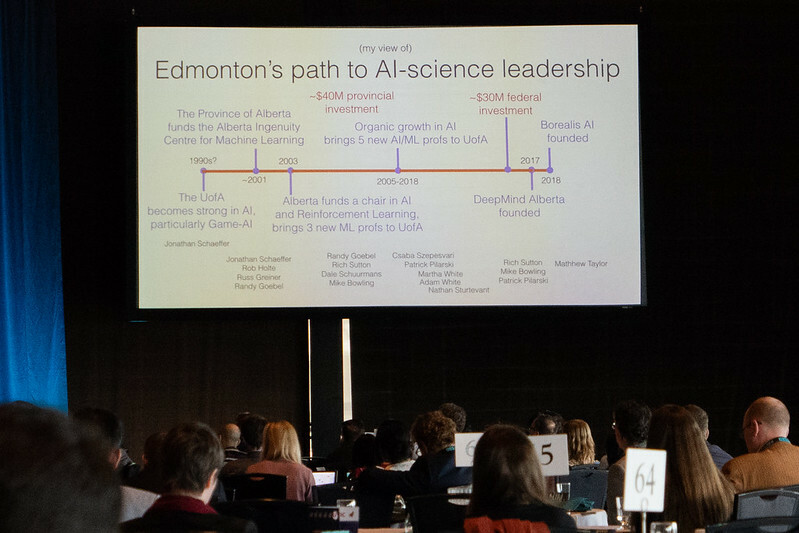 Though the research taking place here in Edmonton and elsewhere has helped to make all of that possible, “the deep learning algorithms are essentially unchanged since the 1980s,” Sutton told the audience. The difference, is cheaper computation and larger datasets (which are enabled by cheaper computation). He showed a chart illustrating Ray Kurzweil’s Law of Accelerating Returns to make the point that it is the relentless decrease in the price of computing that has really made AI practical. “Methods that scale with computation are the future of AI,” he said. That means learning and search, and he specifically called out prediction learning as being scalable. “Current models are learned, but they don’t learn.” He cited speech recognition as an example of this. “Planning with a learned model of a limited domain” is a key challenge he sounded excited about. He spoke positively about “intelligence augmentation”, perhaps as a way to allay fears about strong AI. I really enjoyed the talk and was happy to hear Sutton’s take on Edmonton and AI. It’s a story that more people should know about. You can find out more about Edmonton’s AI pedigree at Edmonton.AI, a community-driven group with the goal of creating 100 AI and ML companies and projects. If you’re looking for more on AI to read, I recommend Wait But Why’s series: here is part 1 and part 2.